However I am very bad at actually making hard copies of my many photographs. but am yet to do it and his birthday was nearly two months ago. 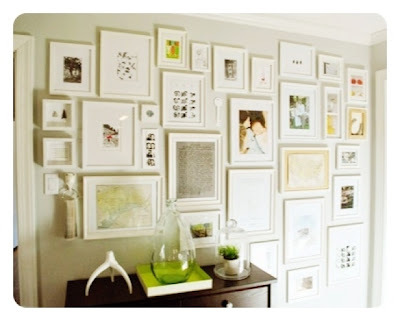 So this week I have been looking for inspiration for some different ways to display photographs. and we definitely need some more pictures of the little man around the place. and get them up on the walls. and the fact that you could easily change the pictures as and when you fancied. as they'd look like polaroids. 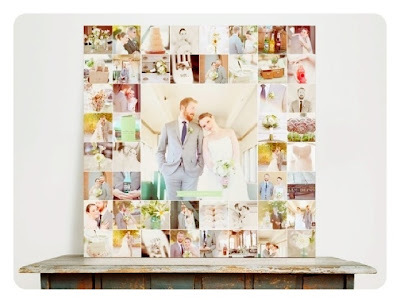 I might see if I can make something similar with some of our wedding photographs. I've been gradually collecting frames for ages to create a photo wall like this. There is a great big space above one of our sofas where something like this would look great. I think it's lovely that you can display art and text and objects as well as photographs on a wall like this. The idea of displaying text brought me to this. and I started thinking it would be lovely to have them up on our walls somewhere. Or the beautiful readings that we had in the ceremony. I love this collage idea. 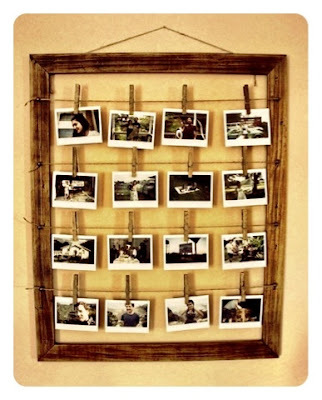 I'd like to do something like this with my One Beautiful Year photographs when I'm finished. I'd like one for our wedding too. And for the beautiful boy's first year. I guess I'd better get cracking...! Can't wait to see what has inspired you lately. Got a whole bunch of creative photo projects in my head (including writing the word 'Family' up the stairs with all our photos around it) - just need to finish the bloody house renovations now! lots of fab ideas there!